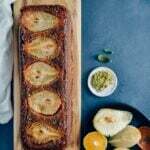 Caramelized pear bread with warming fall spices is an irresistible dessert. Cook water, orange juice, sugar and butter in a medium skillet over medium heat, stirring until sugar is dissolved and the mixture is slightly reduced, about 5 minutes. Add pears, cut side up. Cook about 3-4 minutes. Turn them over and cook just until slightly softened, about 4 minutes. Let them cool slightly. Line the bottom of a 9×5 inch loaf pan with parchment paper. Place the pears, cut side down in the pan. Heat the remaining liquid in the skillet and pour it over the pears. Freeze while you prepare the batter. Using an electric mixer on medium speed, beat eggs and sugar until pale and fluffy about 5 minutes. Add in olive oil and mix well. In a medium bowl, whisk together the flours, cocoa powder, baking powder, baking soda, salt, cardamom and cinnamon. Pour the dry ingredients into the wet mixture in 2 additions. Don’t over mix. Just use a hand whisk and whisk until everything is combined. Remove the pan from the freezer and pour the batter over pears. Smooth the top. Bake until top is golden or until a tester inserted in the center comes out clean, about 50 minutes. Sprinkle ground pistachio on the bread before serving.